What is the best exfoliating face cleansing brush? Exfoliating face cleansing brushes have been around for a few years now, and lots of people rave about them. They are designed to clean the face more effectively than your hands, and help your lotions and serums work better. There are so many versions out there at every price point; it can be hard to choose the top electric face cleanser for your skin and budget! One exfoliating brush that seems to be very popular lately is the Clarisonic Mia 2, and I wanted to know if it truly is the best one out there right now. So, I tested 9 different electric cleansing brushes so you don’t have to! During my research, I discovered that there is a huge difference between cheap and luxurious brushes. What are the Differences Between Oscillating and Spinning Facial Brushes? Acne cleansing brushes work great on your skin and should become a vital part of your cleansing routine, so we should at least understand how they work, right? These brushes work in one of two ways: oscillating and spinning; it is all based on the brand. The brushes also work based on the number of repetitions per second of the bristles. When this is integrated with the formula of your favorite cleanser, you get marvelous benefits. Oscillating facial cleansing brushes, like the Clarisonic, twist from side to side very, very rapidly; you may think of it as “to and fro”. Due to the skin’s elasticity, the brushes are able to twist it from side to side. The motion causes the hard grime to be twisted out of the skin’s pores because it is not as flexible and elastic as the skin. The bristles of the brush simply brush away any impurities and make-up. 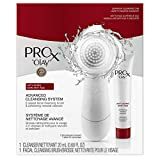 Spinning cleansing brushes, such as the Olay Pro-X, move in a circular motion in order to push dirt and grime out of your pores. The skin is elastic and moves, but the impurities do not, which is how dirt and makeup gets pushed out of pores and skin crevices. The bristles then brush off the impurities that have been forced out of the pores. Now, let’s look at a variety of face brush sets and what they each have to offer. We will look at both luxury and cheap options, and hopefully after reading this you will find the best one for you! The Mia 2 is the next generation in sonic face cleansing technology. You will benefit from using it, just like the original Clarisonic Mia facial cleansing brush. You will continue to have access to the best features that we have already experienced; now, it is only more advanced. sitive skin needs the gentle touch. This is not one of the features of face cleanser machines. It is a gigantic improvement for your cleansing routine. You will love having soft, supple and clean skin for the first time when you choose the Clarisonic Mia 2. The Clarisonic Mia 2 is ideal for daily use. It is an excellent choice, and it would be perfect for all of your skin cleaning needs for your regular routine. Whether your skin is already clean or grimy, this device will surely get the job done. It also works very well as an exfoliating brush. Now is the time to move forward with the Clarisonic Mia Fit . This is a sonic-powered dermabrasion brush that is suitable for carrying along with you whenever and wherever you may be traveling. This brush will leave you with soft, clean and healthy skin just by conveniently plugging it into the wall outlet and letting it work its magic on your skin. If you think that you would like to use the Mia Fit on a daily basis, you should use the second speed setting. For those with sensitive skin, or if there is a day when your skin feels particularly sensitive, the first speed is ideal for you. The two settings use a gentle cycle so your skin does not become irritated. All that you need comes with this cleanser: brush, charger and most importantly – a two-year warranty. If you lead a busy lifestyle and you are always on the go, the Alpha Fit is the sonic cleansing device for you. Its features are incredible and cater to those with facial hair. This means that you have no need to go back and forth switching brushes if you have facial hair. This brush works great with both! This kit includes the brush, cleanser, charger and also a two-year warranty. You will see that with just one use, your face will be oil, sweat, and dirt free. These three things are very difficult to remove completely for a person with facial hair. The Alpha Fit has been designed to work specifically with facial hair painlessly so you do not have to be concerned with hair pulling or tearing at the skin. Men with facial hair need to use the second speed setting to properly clean the skin under the hair. If you have a clean-shaven face, you will need the first speed setting. This is perfect for individuals who are looking for more comfortable and more hydrated skin that is much smoother to the touch. The Alpha Fit offers this and so much more. You will obtain a closer shave so your skin can stay clean and fresh longer – without the discomfort or aggravation commonly associated with shaving. The LumaRX acne brush is a wonderful way to clean your skin daily. Its purpose is to assist you in fighting the wear and tear that your skin goes through daily. It will also ensure that your face stays in good working order. You should consider this alternative if you want something that is gentle enough to suit each lifestyle and skin type. If you need a mechanical acne brush, the LumaRX is ideal for you because it uses a gentle dual-action cleansing, and it is a firm exfoliating brush. You will see fantastic results after cleansing your face with this brush. It is suitable for everyday use to remove make-up, impurities and excess oil that will surely clog your pores, making your skin look old, thick and wrinkled because of too many dead skin cells. The LumaRX rejuvenates the inherent radiance of your skin while it gives your skin the extra nudge in the right direction. It comes with the appropriate tools that they have made available specifically for your use. Deep-clean each day using this sonic device and you will have the radiant skin you have always dreamed of, just by experimenting and discovering which feature suits you best. If you need a mechanical brush for facial cleansing that works wonders for your skin, then the Michael Todd Soniclear Elite Sonic Skin Cleansing System is perfect for you because of its powerful, six-speed setting and two operating modes. You may program in the ultimate cleaning schedule so that you will be able to achieve beautifully clean and healthy skin in no time at all. Soniclear technology is more powerful than a number of other brands currently for sale. If you use it properly, the amazing features of this acne brush will work wonders for you in a short amount of time. There are various cleaning options, and the automatic timer lets you know when it has finished cleansing one area of the skin and is ready to be moved to another area of skin. This sonic cleanser has even been manufactured to withstand being submerged, which means you can use it in the shower or bath – a big plus. Of course, we must also comment on its ergonomic shape. The convenience of today’s advanced technology has been designed so that you may experience the future of skin cleansing now. The Philips PureRadiance Multi-Speed Facial Cleansing System is a quality facial cleanser that gives you beautiful skin because it is intended to be the right sonic facial cleansing brush for you. It offers you gentle, deep cleansing to ensure that you have improved skin in both texture and appearance. This cleansing brush removes make-up and grime from your skin up to 10 times better than other techniques. Make-up and grime can clog pores, causing acne and blackheads. This special technology utilizes basic vibrations and pulses that vibrate your pores clean. It benefits you to have a simple skin care technique and protection against the recurrence of dirt and grime refilling your pores. Your skin will look better than you have possibly imagined, so be sure to use this mild exfoliating device as you know that it is safe and comfortable to use. Your skin will then absorb your favorite creams and moisturizers more easily because it is cleaner. You cannot put a price on the value of healthy looking skin! There are many cheap cleansing brushes on the market, many of which you can easily find in your supermarket or drugstore. It may be tempting to buy one of these, but don’t be fooled – they are not as great as you might think! Here are a few of the more popular inexpensive brushes, and why I think you should skip paying for them and invest in a better brush. This was the only rechargeable cleansing brush I reviewed that was cheap, but it is a popular brand, so I thought I’d try it out. It is gentle for a spinning brush, but the battery life was terrible. I also don’t like that I need to buy/remember to bring an adapter when traveling. While Clinique claims it has a long battery life, I found that it wasn’t true. You will have to frequently recharge it, which is a huge pain. This device is popular because it is widely available in drugstores. However, it was too harsh on my skin, leaving scrapes that could easily turn into an acne breakout! Definitely reconsider buying this if you have sensitive skin! If you are going to buy a cheap face cleansing brush, this is the one I recommend. It doesn’t have a lot of options/settings, but it is perfect for travel and is backed with a warranty in case anything breaks. What Should I Look For in a Facial Cleansing Brush? The best type of facial brushes has multiple speed settings. The Clinique Sonic has one speed setting and the Clarisonic Mia2 has two speed settings. It is good to have options in terms of speed settings because there will be times when your skin is sensitive, and you will want to exfoliate gently. If your skin just needs normal cleansing, a single speed setting on the exfoliating brush is right for you. Acne cleansing brushes work in one of two ways. There are oscillating brushes like the Clarisonic Mia2, and there are also spinning brushes like the Olay Pro-X Advanced Cleansing System. There is a big difference between these two facial cleansing brushes. The spinning brush cleans the surface of the skin and abrades everything off of it. This results in weakened skin that may be prone to wrinkles and acne. As for the oscillating brush, this vibrates at a very fast rate, so it pushes your cleanser deep within your pores to clean them, and this is how the impurities come out. It is a gentler way to cleanse the skin than the more abrasive spinning brushes, and will be better for sensitive skin. These sonic brushes use either rechargeable or AA batteries. Rechargeable batteries are nice and cheap, and they cost less in the long run. A number of people prefer to not have their acne brush break down during the middle of a cleansing routine, so they opt for regular AA batteries. If you are from the United States and going on vacation in Europe, there is no need to carry an adapter – just some extra AA batteries. Your preference for batteries will depend on where and when you want to use your brush. The cleansing brush packages must contain batteries or an adapter. Some devices have additional heads for face and body, while other devices have complementary skincare products included in the packaging. Cleansing brushes vary in quality and price, so keep that in mind as well. A thirty-dollar exfoliating brush can as good as a one-hundred-dollar one – at least for a while. However, the quality and durability of the skin cleansing brush system is more important. The quality of the facial cleansing brush is one of the key features that you should be paying attention to. It is important to note that there are a number of inferior products on sale and they use similar designs to the authentic brushes. They may appear similar and the settings may be similar, but some of them spin and pull your skin while you use them. This causes trauma to the skin like cuts that may later on lead to breakouts. Some acne cleansing brushes may be used for quite a few months before they need to be replaced, while there are those that may be used for a lifetime. It sounds like common sense, but a ninety-dollar brush really does last longer than a thirty-dollar brush. Also consider how long each brush head can be used before it needs to be replaced! You may only spend $30 for a cheap brush, but you’ll have to replace the brush heads more often, which can quickly get expensive. Luxury brushes have higher quality brush heads that last much longer – and that can work out to be cheaper in the long run! Be sure to always read and understand the warranty that is included in the packaging of your facial cleanser. When a company assures you that their product is backed by a lifetime warranty, then their product normally is of a high quality and durability. Another way to recognize an inferior product is when there is no warranty or there is a warranty that covers a short period of time like 90 days, for instance. When you make your purchase, keep these two options in mind: purchase one device at a higher cost and have no reason to buy another one, or pay considerably less and purchase one twice per year or so. How Do I Properly Use and Care For My Facial Cleansing Brush? For Clarisonic products, you should know that cleansing products with abrasives are not recommended because brushes for acne are already gentle exfoliating brushes. Also, cleansers that have glycolic acid as a main ingredient are used as an exfoliant, so it will not be wise to integrate these with your skin care system. You should try to use cleansers that are thick and creamy in nature. There are two top cleansers to use with the Clarisonic line of brushes: Cetaphil Daily Facial Cleanser and the Clarisonic Gentle Hydro Cleanser. Cetaphil Daily Facial Cleanser is a low-foaming, scent-free, non-comedogenic cleanser and gently removes make-up, impurities and excess sebum. It does not dry out your skin, nor does it interfere with its pH balance. Cetaphil Daily Facial Cleanser is perfect for all skin types. I have been using this for four years and my dermatologist recommended it to me. Since I have been using this product, I have had absolutely no regrets. My skin is not overly dry, but the grime is gone, leaving clean, fresh and soft skin. You could easily use this product with any of the brushes I’m reviewing today! You may use Clarisonic Gentle Hydro Cleanser twice daily while washing your face with your hands. This is especially ideal if you have sensitive skin, as it is a no-foam cleansing milk formula that hydrates and softens skin. It is soothing and leaves skin feeling comfortable without any burning sensation. It may be also be used twice weekly with the Clarisonic Mia/Mia2/Alpha. Clean your brush regularly by using a mild soap and lightly scrubbing it with lukewarm water. This should be done weekly unless you prefer to clean it after every use. Personally, I prefer washing my brush after each use. It is recommended to place your freshly washed brush in the sun so that it does not become mildewed or accumulate bacteria. Most facial acne brushes say they can be used twice daily because they are quite gentle. However, I believe that they should not be used more than two to three times per week and only at night. You do not want to strip the skin of its natural protective layer and natural oils because this could disturb your skin’s natural pH balance. If you have aged or sensitive skin, you should only use it once or twice weekly. Do not spend more than three to four minutes per session using the brush because it may irritate your skin or damage capillaries. For those of you with sensitive skin, use it for only two to three minutes per session. Do Facial Exfoliating Brushes Really Offer Deep Skin Cleaning? Many people believe that using an effective acne cleanser and their hands will be enough to properly clean their skin, but they could not be more wrong. A few years ago, electric cleansing brushes hit the scene and we found out just how essential their exfoliation capabilities are. r.
Cleansing your skin properly is vital for good skin health. When we see the emergence of these motorized acne brushes, we cannot help but be grateful for a new and improved means of obtaining clean, glowing, healthy skin. We all applaud better methods of cleansing our skin to reveal its natural beauty underneath. Whether it is the spinning or the oscillation method, these brushes work due to the rapid movement of the motors. When you combine these sonic brushes with a good cleanser, you get double the results. The bottom line is that these brushes are more effective than our hands at getting rid of impurities that have become hard and compact over time and embedded themselves in the skin and the pores. The result is clean, healthy skin that is better able to absorb all of the rich goodness that is contained in the expensive face creams that we use. The even better news is that it is so much more worthwhile to those of us with acne. A bonus of the cleansing brushes is the natural exfoliation that we achieve. 1 What is the best exfoliating face cleansing brush? 1.1 What are the Differences Between Oscillating and Spinning Facial Brushes? 1.4 What Should I Look For in a Facial Cleansing Brush? 1.5 How Do I Properly Use and Care For My Facial Cleansing Brush? 1.6 Do Facial Exfoliating Brushes Really Offer Deep Skin Cleaning?